Diving Indo. World-class diving in Bali. Diving Indo’s 5-star PADI resort is a friendly, family-run, Sanur dive shop jointly founded by Mariusz and Eunice, its proud Polish-Indonesian owners. Diving Indo’s story begins in 2005 when Mariusz, after completing his diving contract in the Maldives, arrived in Bali for a two-week holiday. Fate had it that just 30 minutes after arriving at the Four Seasons, he met – and fell in love with – his wife to be, Eunice (Ike). Diving Indo was founded and registered in 2006 when Mariusz and Ike decided to share their love of Bali’s amazing dive sites with the world. Mariusz’s extensive career managing and operating diving centres in Ambon and Banda means that Diving Indo offers you the very best in scuba diving. Diving Indo’s recently built dive resort is conveniently located in Sanur, only a 30-minute speedboat ride from one of Bali’s premier scuba-diving areas – the legendary Nusa Penida island. Diving Indo offers you a rich menu of diving around Bali as well as in other regions of Indonesia – Komodo, Raja Ampat, and Sulawesi. We also offer you the opportunity to dive the mysterious Spice Islands: the Maluku and Banda archipelago. Diving Indo’s 5-star PADI dive resort offers you a full range of scuba-diving courses – we really have something for everyone – from beginner to dive master. Our professionally accredited dive instructors are multilingual: we speak Polish, English, Russian, German, Spanish, French, Italian, Serbian, Croatian, and Bahasa Indonesia. Enjoy being picked up from your hotel or villa in our comfortable, air-conditioned mini-coaches to start your Bali diving adventure. Relax and feel the wind in your hair as Diving Indo’s fleet of Mercury-powered speed/dive-boats whizz you to your dive site (and home again) in comfort and style. At Diving Indo, your safety and comfort is our number one priority, that’s why we only use the newest and best dive gear – SCUBAPRO®. All our diving equipment is carefully double checked by our professional staff before you dive, and all our dive gear is renewed every two years. 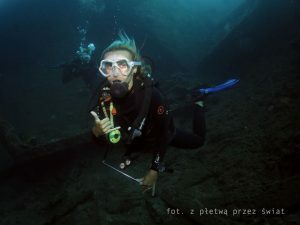 Mariusz is the founder and co-owner of Diving-Indo. He trained as an ichthyologist, and his love of the marine world saw him become a PADI diving instructor in 1998. His long experience in the diving industry began in 1990 as the president of the Academic Diving Club (Skorpena) at university in Poland. During his studies, he organised diving trips, training camps, and CMAS diving trips. One of his biggest adventures was a camper-van dive trip to Egypt with his buddies in 1995. After 8000km, dozens of borders, bribes, amazing dives, and the freedom of the open road, he was rarely to be found ‘in the office’! This changed in 2002 when an impulse visit to Sipidan, Malaysia, saw him land a job on a dive safari touring Egypt, Sudan, and Croatia. He followed this up with a year in the Maldives working as a dive master at one of its most expensive hotels. Finally, he headed to Bali for a quick relaxing holiday, where he met the love of his life – Ike and co-founded Diving Indo with her in 2006. Mario also has a wealth of diving experience from managing dive centres in Ambon and Banda on the Maluku archipelago, where he indulged his passion for underwater photography and film and discovering new dive sites off the beaten track. Over his long career in diving, he has been lucky enough to visit almost all of Indonesia’s most famous and interesting dive sites. 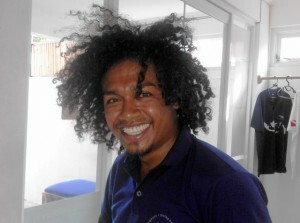 An immensely kind spirit, Diving-Indo’s Ike will make you feel right at home when you visit us in delightful Bali. Ike is a natural multitasker – her incredible organisational skills keep Diving Indo running smoothly. Ike’s passions are scuba diving (she is a PADI Rescue Diver with over two hundred dives), yoga, salsa dancing, and surfing. She has worked in Japan and at dive centres in Banda and Ambon in Maluku. 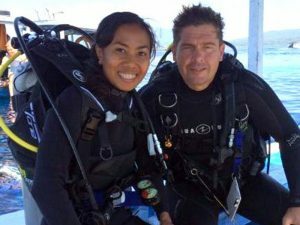 Currently, she runs Diving Indo with her husband, Mario. Ike just loves all animals – her house is a sanctuary for lost or abandoned pets. Ike is also a language genius – she speaks five Indonesian dialects, English, Japanese, and – increasingly – Polish and Russian too! As a child watching Jacques Cousteau videos, Anna dreamed about becoming a diver. Unfortunately, the reality of life meant a career in computer programming, and generally being ‘in the office’. All this changed in 2001 on a holiday in Egypt. Anna took her first scuba dive and was instantly hooked. 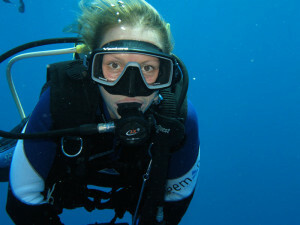 She quit her office job and began working as a dive master in Egypt. After several years in Egypt, she headed to Bali where she has worked since 2007. Her greatest passion is filming the marvels of the underwater world, especially during Diving Indo’s dive safaris to remote corners of the Indonesian archipelago. Anna speaks Russian, English, and Bahasa Indonesia, and understands Polish. Number of dives: over 4000, with over 2500 in Bali and Indonesia. Natalia is our lovely PADI Instructor from Poland. She is an experienced underwater photographer – her favourite marine creature is the stunning mantis shrimp. Natalia loves teaching the PADI Rescue Course. She speaks Polish, English, Bahasa Indonesia and is studying Russian. 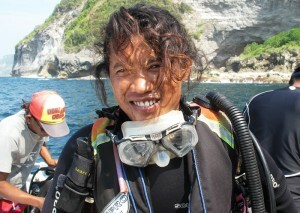 Idy is one of our friendly PADI instructors from Bali. After spending the last few years working in Komodo on liveaboards, Idy has returned home to Bali to focus on his passion: teaching diving! He is also fluent in English, Balinese, and Bahasa Indonesia. Marianne hails from England. Her fascination for diving began in 1992 in the cold, murky waters of the UK. 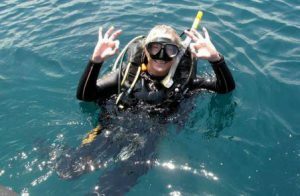 After deciding to leave the rat-race in 2003, she became a PADI Instructor in Egypt, before moving to South East Asia in 2005. Now a PADI Staff Instructor and general manager of Diving Indo, she makes sure that everything runs smoothly and all our guests have a great time. Budi is one of our PADI Divemasters from Ambon, Indonesia. He joined Diving Indo in 2008. His eagle-eyed vision means he is an expert at spotting the small underwater critters that others miss! This makes him your Divemaster of choice if underwater photography is your thing! With over 5,000 dives, Budi has a wealth of critter-spotting experience to share with you! Hadi, from Jakarta, completed his first dive in 2001 and was instantly enthralled. He became a PADI Divemaster in Bali in 2009 and joined Diving Indo in 2013. His favourite dive sites in Bali are around the small islands of Gili Mimpang and Gili Tepekong. Hadi has racked up an incredible 10,000 + dives – diving with him, you are in the safest of hands. Bobby, from East Timor, has spent 5 years in Poland and so speaks Polish, English, and Bahasa Indonesia. 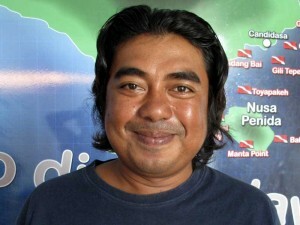 He has returned to Bali to join Diving Indo as our snorkel guide and has now made his way up to PADI Divemaster. Eka, Diving Indo’s dive-boat captain on the Eunice 2, comes from the island of Serangan – famous for its excellent sailors and fishermen. With Eka at the helm, you are assured of a safe, comfortable dive. Reno, his able crew member, takes care of all the dive equipment and refreshments aboard to make sure you have all you need. The fantastic crew aboard Diving Indo’s Eunice 3 – Fajar, Krishna, and Rendy – help keep the boat clean and in full readiness. They also help you out with dive gear, entry and exit, as well as serving lunch and refreshments, handing out fresh towels, and generally being helpful and friendly on the boat. Diving Indo’s drivers, Benny and Nengah, know every corner of the island. From picking you up or dropping you home from diving to taking you on full-day land tours, they also take care of the maintenance and cleanliness of our transport. The always-smiling office support team, Kelly and Elya make sure Diving Indo runs smoothly every day, and do their best to help our guests with any requests. Ilus comes from West Timor, arriving in Bali at the beginning of 2016. 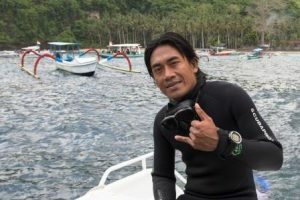 Prior to joining Diving Indo, he worked as a boat crew member. He carefully looks after all Diving Indo’s equipment and is also a driver when needed. Hopefully, you will have the chance to meet this friendly man on one of your trips! Sanur Guest House’s friendly team make your stay with us as relaxed and comfortable as possible. Nanny to Inda, Leon, and Alice (Mariusz and Ike’s beautiful kids who are growing up quickly). Thanks to Damaris, Mariusz and Eunice have time to work!